Often while developing an app, We ran into an issues where the iPhone keyboard slide up and cover the UITextField/UITextView. IQKeyboardManager allows you to prevent issues of the keyboard sliding up and cover UITextField/UITextView without needing you to enter any code and no additional setup required. To use IQKeyboardManager you simply need to add source files to your project. IQKeyboardManager works on all orientations, and with the toolbar. There are also nice optional features allowing you to customize the distance from the text field, add the next/previous done button as a keyboard UIToolbar, play sounds when the user navigations through the form and more. 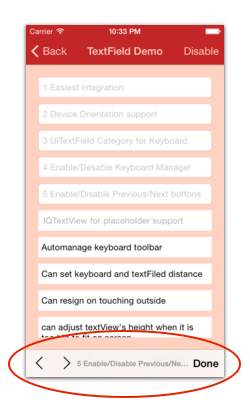 If you’re planning to build SDK/library/framework and wants to handle UITextField/UITextView with IQKeyboardManager then you’re totally going on wrong way. I would never suggest to add IQKeyboardManager as dependency/adding/shipping with any third-party library, instead of adding IQKeyboardManager you should implement your custom solution to achieve same result. IQKeyboardManager is totally designed for projects to help developers for their convenience, it’s not designed for adding/dependency/shipping with any third-party library, because doing this could block adoption by other developers for their projects as well(who are not using IQKeyboardManager and implemented their custom solution to handle UITextField/UITextView throught the project). If IQKeybaordManager conflicts with other third-party library, then it’s developer responsibility to enable/disable IQKeyboardManager when presenting/dismissing third-party library UI. Third-party libraries are not responsible to handle IQKeyboardManager. In AppDelegate.swift, just import IQKeyboardManagerSwift framework and enable IQKeyboardManager. IQKeyboardManager (Objective-C):- Just drag and drop IQKeyBoardManager directory from demo project to your project. That’s it. In AppDelegate.swift, just enable IQKeyboardManager. 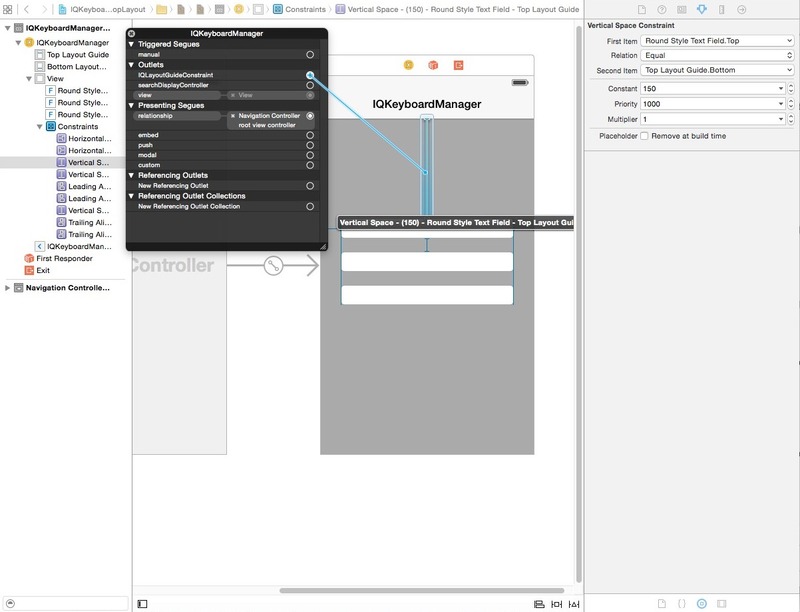 Xcode 6:- Goto iOS Simulator->Menu->Hardware->Keyboard->Connect Hardware Keyboard, and deselect that. Xcode 5 and earlier:- Goto iOS Simulator->Menu->Hardware->Simulate Hardware Keyboard, and deselect that. If you set [[IQKeyboardManager sharedManager] setEnable:NO] and still automatic toolbar appears on textFields? Probably you haven’t heard about @property enableAutoToolbar. @property enable : It enable/disable managing distance between keyboard and textField, and doesn’t affect autoToolbar feature. @property enableAutoToolbar : It enable/disable automatic creation of toolbar, please set enableAutoToolbar to NO if you don’t want to add automatic toolbar. Now IQKeyboardManager can work with topLayoutConstraint and bottomLayoutConstraint with a bit of manual management. Please check below Manual Management->Working with TopLayoutGuide and BottomLayoutGuide section. 1) Manually enable IQKeyboardManager Swift Version. From Swift 1.2, compiler no longer allows to override class func load() method, so you need to manually enable IQKeyboardManager using below line of code in AppDelegate. 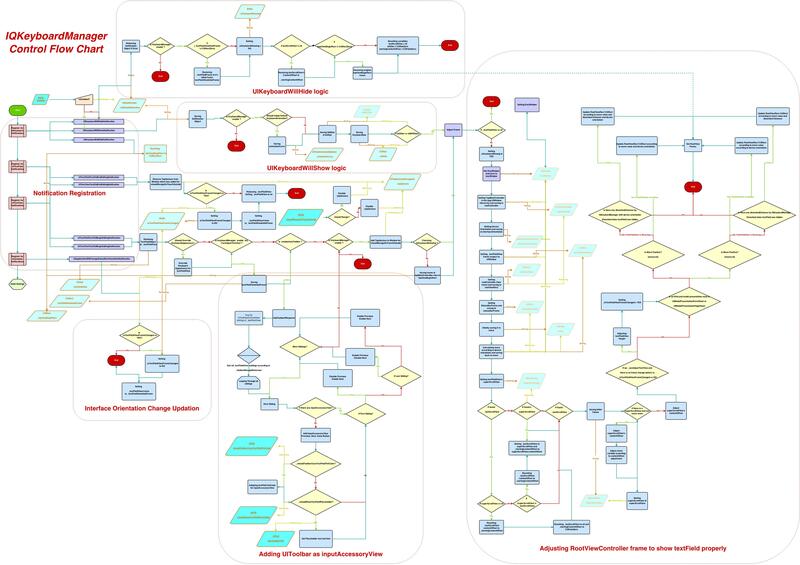 If you are not using storyboard or xib and creating your view programmatically. Then you need to override ‘-(void)loadView’ method of UIViewController, and need to set an UIScrollView instance to self.view. Technically IQKeyboardManager moves upwards/downwards of currently presentedViewController’s view. So if you’re pinning your UITextfield/UITextView with TopLayoutGuide/BottomLayoutGuide then you’re saying Keep x distance from screen top(I don’t care about where is self.view)‘. In this case your view is moved upwards but textField remains at same position and keeping x distance from screen top. If you would like to disable Auto Toolbar for a particular ViewController then register ViewController with -(void)disableToolbarInViewControllerClass:(Class)disabledClass method in AppDelegate. It assign all the responderView delegates to self, and change keybord Return Key to Next key. 2) set instance variable to nil in dealloc method. 2) check for isAskingCanBecomeFirstResponder in textFieldShouldBeginEditing: delegate. //Do your work on tapping textField. +(instancetype)sharedManager : Returns the default singleton instance. @property BOOL enable : Use this to enable/disable managing distance between keyboard & textField/textView). @property CGFloat keyboardDistanceFromTextField : Set Distance between keyboard & textField. Can’t be less than zero. Default is 10. @property BOOL preventShowingBottomBlankSpace : Prevent to show bottom blanck area when keyboard slide up the view. Default is YES. (#93). @property BOOL enableAutoToolbar : Enable autoToolbar behaviour. If It is set to NO. You have to manually create UIToolbar for keyboard. Default is YES. 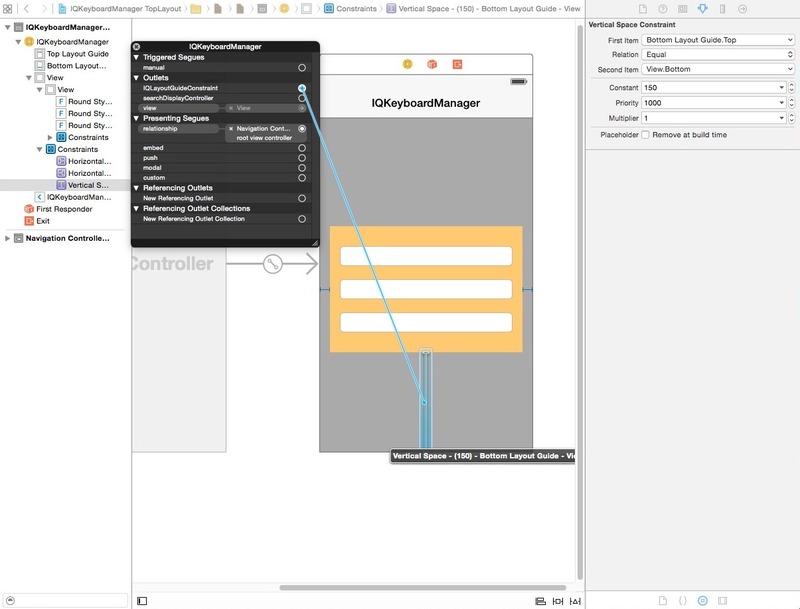 @property IQAutoToolbarManageBehaviour toolbarManageBehaviour : Setting toolbar behaviour to IQAutoToolbarBySubviews to manage previous/next according to UITextField’s hierarchy in it’s SuperView. Set it to IQAutoToolbarByTag to manage previous/next according to UITextField’s tag property in increasing order. Default is IQAutoToolbarBySubviews. 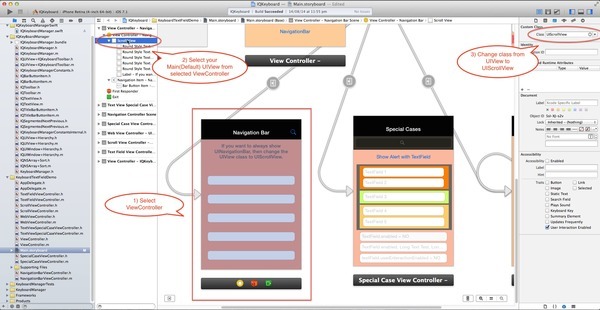 @property BOOL shouldFixTextViewClip : Adjust textView’s contentInset to fix fix for iOS 7.0.x -(#Stackoverflow). Default is YES. @property BOOL overrideKeyboardAppearance : Override the keyboardAppearance for all textField/textView. Default is NO. @property UIKeyboardAppearance keyboardAppearance : If overrideKeyboardAppearance is YES, then all the textField keyboardAppearance is set using this property. -(void)resignFirstResponder : Resigns currently first responder field. @property BOOL shouldPlayInputClicks : If YES, then it plays inputClick sound on next/previous/done click. Default is NO. @property BOOL shouldAdoptDefaultKeyboardAnimation : If YES, then uses keyboard default animation curve style to move view, otherwise uses UIViewAnimationOptionCurveEaseOut animation style. Default is YES. 2) Enable/Disable Keyboard Manager when needed with enable boolean. 4) AutoHandle UIToolbar as a accessoryInputView of textField/textView with enableAutoToolbar boolean. 5) AutoHandle UIToolbar can be manged by superview’s hierarchy or can be managed by tag property of textField/textView using toolbarManageBehaviour enum. 6) UIView Category for easily adding Next/Previous and Done button as Keyboard UIToolBar, even automatic with enableAutoToolbar boolean. 7) Enable/Disable Next/Previous buttons with Category methods, even automatic with enableAutoToolbar boolean. 8) Set keyboard distance from textFields using keyboardDistanceFromTextField. 9) Resign keyboard on touching outside using shouldResignOnTouchOutside. 10) Manage UITextView’s frame when it’s hight is too large to fit on screen with canAdjustTextView boolean. 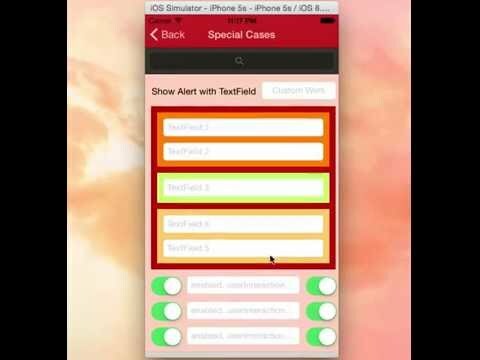 11) Can manage UITextField/UITextView inside UITableView/UIScrollView. 12) Can play input sound on Next/Previous/Done click.